That's what the large bale feeder is for. The concept is simple; a self feeding structure that holds 32 round bales. The cattle eat from one end to the other through feed panels that roll on a simple rail system. The rendering shows the feeder full of hay and ready to use. As with any structure, site location and orientation is important. 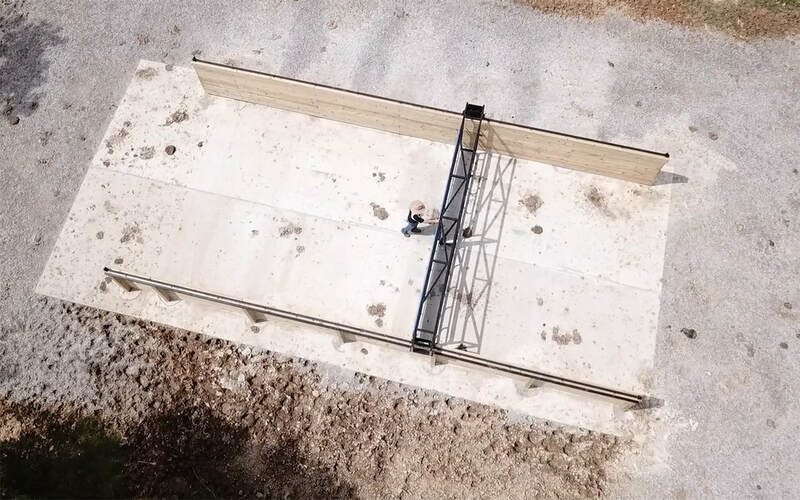 This structure opens to the south to allow for the winter sun to melt and dry any ice or snow that may be inside the structure allowing the cattle sure footing. The concrete floor is sloped from the center out to drain away moisture. Everything was built out of common building supplies other than the rolling rack that the feed panels bolt to. It was custom built for this exact size structure. 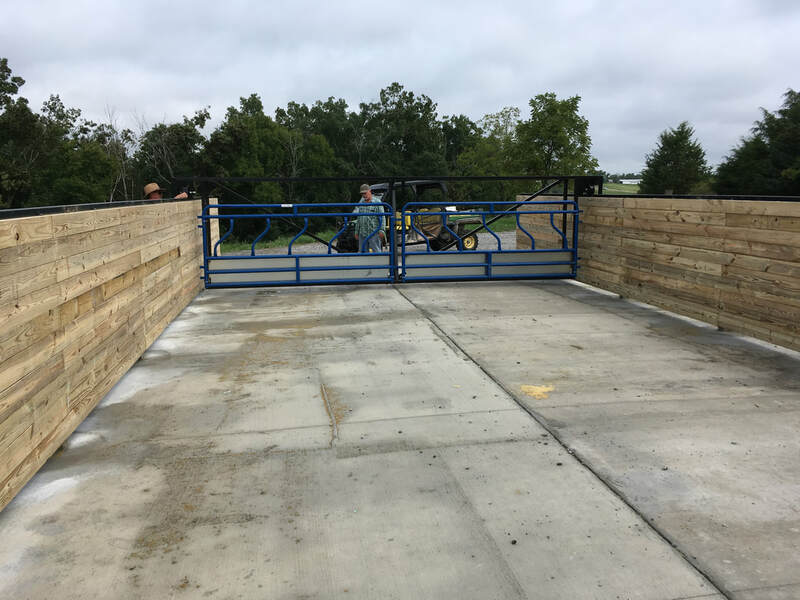 Standard size feed panels were used so that if they get bent or beat up they can be easily replaced with new ones.The rail system that the rack sits on is 2 inch square tubing bolted down on the top of treated 2x6 walls. The rack rolls freely using two large caster wheels on each side. It also has a slide that rides under the rail so that the cows can't lift the rack off the wall. The entire rack weights 1,200 lbs but rolls easily enough that a light breeze will cause it to move. Notice the proximity of the water to the Large Bale Feeder. In a winter/hay feeding scenario you never want water access closer than 150 feet to the hay. If the water is in close proximity the cattle will have no reason to leave and will linger and make a much bigger mess of mud and manure than is necessary. Our tire placement meets this 150 foot minimum recommendation. The efficiency of this system is in the scale of the structure itself. It holds 32 round bales. So the question is: how long would 32 bales last your cow herd? It depends on the size of your herd, right?. It might last a couple of weeks, it might last a couple of months, or it could last all winter. Keep checking back for layout designs and further information!